The Capital Markets Authority of Kenya formally launched the 2018 Universities Challenge at KICC in Nairobi on September 25, which aims to equip young people with investment skills and nurture a culture of financial literacy and investing and saving for the future through participation in capital markets. The 2018 edition of the Universities Challenge, which runs from September 25 to December 31, will feature 6,015 participating students from 37 local universities. They will go through five stages of elimination through testing their financial literacy and knowledge, starting with an online exam, followed by a stage dubbed a “scavenger hunt”, then they will make presentations at universities followed by presentations to CMA staff. There will then be a grand finale event in Nairobi where twelve top students will get to pitch to investment stakeholders, CMA staff and representatives of all universities in the challenge. Speaking at the launch, CMA CEO Paul Muthaura, said that the average age of entrants was 23 years and that this was as a result of them targeting ongoing students and make them young investors because of the long-term nature of capital markets investments. Also that the use of technology was part of the CMA’s engagement process of expanding financial literacy as well as to transform the visibility of the authority through social media. He added that the CMA was in the middle of implementing a ten-year master plan and had won several awards for being among the most innovative market regulators in Africa. The winner of the 2018 inter-university competition will get a grand prize of a Kshs 150,000 (~$1,500) portfolio of listed securities of their choice and the university where the student comes from will get investment textbooks worth Kshs 75,000 for its library. Three other winners will get fully paid 3-day educational trips to observe a securities exchange and capital markets regulator in Africa. This entry was posted in CMA Kenya, ideaexchange, NSE investor awareness, NSE portfolio, scholarships on September 26, 2018 by bankelele. What can shares worth Kshs. 150,000 do for your life? How about a trip to a foreign country? How about rewarding your university with books worth Kshs.75, 000? And what about being a guru in investing in the capital markets? This is what is at stake for the winner of the Capital Markets Authority’s University Challenge 2018. The Challenge is open for undergraduate university students in universities that have confirmed participation. Register for this Challenge from 8th August 2018 to 22nd August 2018. Check the CMA website and social media pages for further details on the University Challenge registration process. This entry was posted in CMA Kenya, ideaexchange, NSE investor awareness, NSE portfolio, scholarships on July 29, 2018 by bankelele. Kenya’s Capital Markets Authority (CMA) will be holding a nationwide University Challenge as part of its education and investor awareness outreach program. The CMA team staged a chat last week on its Facebook page where its staff answered dozens of questions from young investors interested in participating in the Challenge, which is the second one in the series after another that was held in 2015. The Challenge is open to all students interested in capital markets. It is for individual young investors (over 18 years), who are enrolled at any university in the country and are in good standing academically (i.e. not on probation, or suspension at their university), and who must not be related to any CMA officials of organizers of the Challenge. 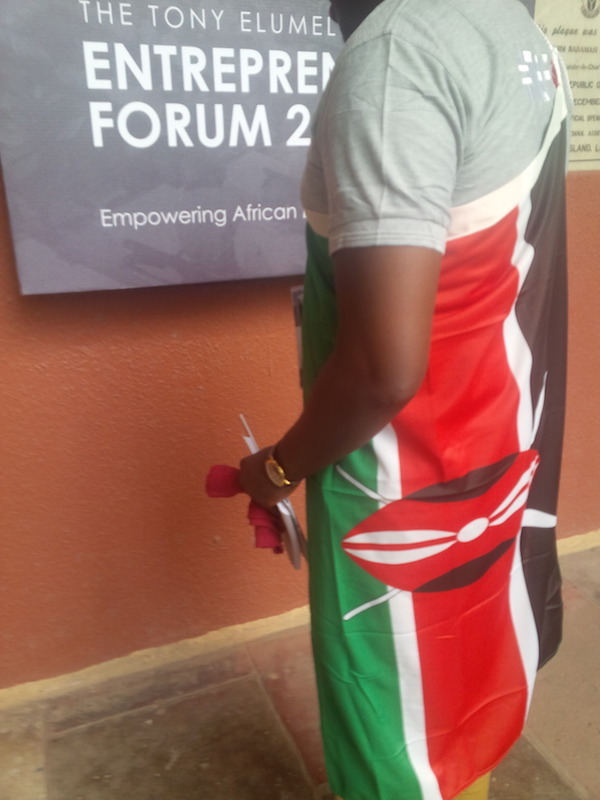 Once the university Challenge starts in mid-July 2018, the CMA which also has an investor education department will organize tours and barazas (meetings) with some Universities and will also have ambassadors at different campuses around the country. The CMA Investor Education department has an investor education page on their website, a library for research, and also a unique resource portal for investors in capital markets to get information which is also useful to people who have graduated and are now outside of campus, but still interested in becoming savvy young investors. The Challenge runs from July to November and students who enter will go through a series of online examinations, and the finalists will also get to give presentations. The top prize is Kshs 150,000 (about $1,500) which the winner will use to buy shares at the Nairobi Securities Exchange (NSE). Other winners will also get a chance to travel and see how capital markets in other African countries work. You can re-watch the chat on the CMA Facebook page. 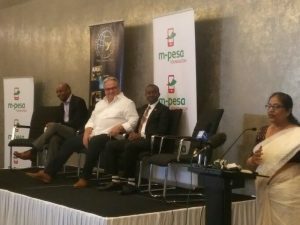 Besides the Challenge aimed at young investors, other interesting and notable CMA opportunities include a sandbox to test bitcoin, block-chain, and other financial technology (fintech) solutions in Kenya. 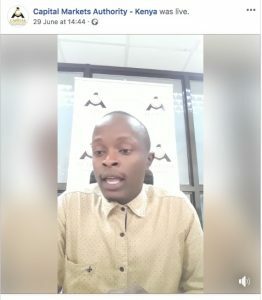 This entry was posted in CMA Kenya, ideaexchange, NSE investor awareness, scholarships on July 6, 2018 by bankelele.